This was a Lunch with Mary first. My first lunch out of town (it was in my hometown of Ottawa) and my first lunch with a family member. I had lunch with my nonna (that is Italian for grandmother) Ida Pollarolo. She is awesome! 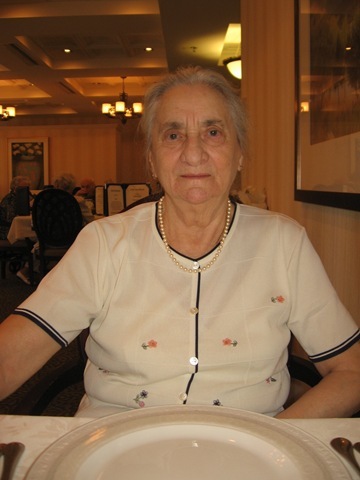 She moved to Ottawa from Italy in the 1950s with my mom, my uncle and my nonno. Quick aside: Since there weren’t many other Italians in my elementary school, I never heard the words nonna and nonno except with my grandparents. I thought they were their actual names and I thought it was such a lovely coincidence that these two people with such similar names had found each other. I have always been very close with my nonna. I remember in high school on a P.A. Day, a lot of my friends were getting together for something fun, but I declined and biked over to nonna’s to hang with her. I miss her a lot since I have moved to Toronto but I try to call her often and send cards and letters when I can. 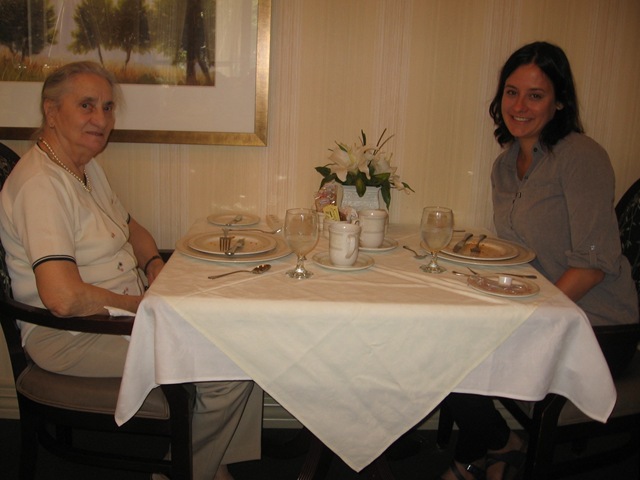 We ate in the dining room of the Lord Lansdowne Retirement Residence where my nonna lives. The food is pretty good at this place. I sort of wish I could have stayed for dinner as it was lobster tail and filet mignon. Although not surf and turf, our lunch was pretty delicious. We both started with the Lansdowne salad, which is a salad that includes grapes, melon and strips of ham. Nonna let me know that she does not like having sweet salads and salads should just be salads without fruit, except tomatoes “which they say is a fruit”. For the main course, I had the meat lasagna and she had chicken cordon bleu. I had apple pie for dessert and she had a fruit bowl. I also had coffee and we both drank water. Total bill is unknown to me as meals are included in her rent and I do know she has to pay a little to have a guest but she didn’t tell me how much. We talked a lot about her childhood in Valdagno. She lived there all her life before coming to Canada and it’s where my mom was born. I have been there a few times, it’s a very lovely town in the foothills of northern Italy. She grew up on a farm and started working where she could as early as she could. She had jobs such as collecting eggs from the chickens and helping her grandfather plant the potatoes. She was the youngest of eight – 7 girls and 1 boy. She spoke very highly of her mother and told me how great a mom she was and that the best thing she taught her was to respect everyone. Nonna said how her mom taught her that no matter someone’s background, education, etc., that we’re all equal. This is a great lesson that her mom passed on to her and one that was passed down to me as well. I love my nonna a lot and treasure all the time I can spend with her since I live in Toronto and don’t get to Ottawa that much anymore. Lately she hasn’t been feeling that well so I decided to come to Ottawa for a weekend and spend as much time with her as I can. I was very happy that she seemed in great spirits, energetic and able to head down to the dinning room for our lunch. We talked about the books that she’s been reading lately. She’s an avid reader across all sorts of genres. She just finished Bella Tuscany: The Sweet Life in Italy by the same author as Under the Tuscan Sun. She then told me that the book is nice but how do people live like that? She said Tuscany is like that if you’re rich, but not if you actually have to work for a living. It was a great observation. Italy isn’t all about tasting wine, eating and basking in the sunshine – there is work to be done! I also just have a general observation about Italian homes. Any Italians that read this, please feel free to weigh in. When you go to a home in Italy (and I have seen this in Italian-Canadians’ homes as well), no matter the size of the home, there is a room somewhere, often in the basement, with a table that seats about 20 people. I always found it strange. So although there is work to be done, we do love to eat! I was telling my nonna how I was going to a wedding the following weekend in Toronto (yay Maja and Mike!) and that I had just recently been in Vancouver for another wedding (Ali and Adrian!!). She looked at me and said that she doesn’t know about weddings anymore, it’s just a ceremony and what’s most important is honesty and being honest with one another. She said if you have honesty, that is all that matters. She is a wise lady. After our lunch, as I left her room to head out and catch the train back to Toronto, we said our usual “I love you” and she followed with what she always says “be good”. So I said “nonna, you be good” to which she replied “there is not a lot of chances here to be bad”. Oh nonna, you’re the best! Tanti baci.